all those people who are amused at my nodding off in the golf cart at 3pm-- just send me your phone numbers so i can call you at 3am. somebody told me it has something to do with age. i am not really making fun of all these folk... could be they are all right and i have been all wrong for years... so i pass this on with the hopes of letting people know so they can try and report back in triplicate..
the most dedicated have been the "mothers vinegar" drinkers..
there are alot of people who are shocked that i never knew about it.... or even heard of it. as far as i can tell it is the human counterpart of WD40. cures/ prevents alot of things..
i have been trying a couple spoonfulls of icecream 3 times a day, and that has tightened up my jeans very well. but "mothers vinegar"? a few people give it to their dogs too... and i never heard of it in the dog community either... apparently sold in the normal stores..
i plan to have a go at it--- i certainlyy have a list of ailments it is guarenteed to cure. it's claim to fame is the sediment... apparently mother found marketing the sediment was easier than getting round to straining it.. mothers are good at that stuff. we have a volunteer who has never had a dog because her mother is extremely alergic-- but from th elook on the face of the woman who dropped the kiddo off, i would suspect she is actually terrified of dogs. maybe she is-- i don't mean to be unkind but i think mothers sometimes take creativity to a new level. i know i did-. and i know there is such a thing as the poor people who can ot havee a ddog in the house... camera marks wife barbara is one of them-- i have seen the proof-- her face gets bright red. ptsd---- which i know is absolutely real-- which also enables a few people to take advantage-- i did not mean to test the validity of a couple of our recipients, but i broke a balloon in the office one day- and the 2 veterans sitting there ran for the door. so back to my mothers vinegar discussion--- shannon said any supermarket has it. for those of you not from this area.. google marketbasket- it is worth the ride..
apparently "the board" decided to fire one of the corporate managers. and the guy was well kknown for taking good care of his employees- at the expense of some stockholders who wanted prices raised so thier profits would be greater..
at the moment- the local market basket has nothing --- zero--- in the bakers dept.... only ham in the meat dept--- and only parsnips in the long tables usually filled with produce. the employees are wandering around with petitions... ""tell them to hire him back"
meanwhile a truck full of beef ( refrigerated) sat with no one to unload it it so it was sold to some other chain brooklyn, ny. and on it goes... i can not imagine what this is costing the company. i went and looked around- the usually crowded store had virtually no one.... even the person riding around in one of the marketbasket electric scooters was in trouble-- it ran out of energy in the back of the store and the person could not walk out too easily... i did offer to help. but the other scooters were dead too. it is a classic arguement--- i think the principal people are related... 2 brothers/ cousins... george and arthur demoulas??? wayne did lift all the plywood out of the raised tractor bucket- into the hay loft...- it was impressive-- i do not know of another person who could have hefted that stack of 20 sheets of 1/2 inch plywood. Larry wanted me to give you an update. He and Ruckus are doing well together. She's a familiar sight in the town hall and at the stores he visits. When he takes a swim, she just stands by the side and watches - doesn't cry or seem upset - she just is waiting for him to come out. She also likes to stand outside the outside shower when he's in there and stick her nose under the door (not too far under - it's only a gap of about two or three inches) just to be sure he's still there. He just says her name and she relaxes. She's gotten used to our chickens but still chases the rabbits out of the yard (which is a good thing). She caught up to a rabbit once and just stood over it and then it ran away. When we eat outside, she curls right up on her Kuranda next to Larry and goes right to sleep - often snoring. She's been such a great help when he has to get up out of the chair. You can see her getting to work when he says "brace." She has several favorite toys and is particular about which one she wants in each room - never moves them around. We just watched our first mail call (we're not usually both around at this time) and when you said "puppy, puppy, puppy" Ruckus got up, came over, and stuck her nose into the computer that I'd put on Larry's lap. When you said it again later, she didn't come over but she did stop chewing on her toy and put her head up. Thanks to you and all your staff and volunteers. it is a very rough concept, but every time we donate a dog  and it does great things fro the  lives of the recipients, i  aam pretty sure the person will outlive the dog  and have to face the lonelyness of loosing their partner..  it is extremely difficult, but the memories of  the happy life they had together will hopefully carry them forward . megan said i should report on all the dogs  graduates or fab uous failures - and i certainly would if people would send me reports..  she gets more than i do because she faces books... i do not..
so we as responsible dog owners of danes--- who have an attraction element like no other,--- we must constantly be aware of wierd situations which the dog  can hardly be blamed for biting... but they will be..
everyone who has had  a service dog  for 6 months has a story "you wouldn't believe what some stupid person did"
on guard !! protect your dog from the people who are asking to be bitten-- they are out there. day with his devotion and his willingness to help me walk. Thank you! and my PT's, not me. dress, and decided to "love on" her Auntie, I would die. night before. We had a plan. shoes and when I tried them on I looked at Wil's and said "Okay, this is it". ever have. She is simply outstanding. much SDP and she changed my life. TOO, SO EVERYONE WILL UNDERSTAND. THE LINK BELOWCREDIT WILL STILL GO TO SDP. YOU MAY WANT TO PUT THE LINK BELOW INTOMORROWS DD, TOO, SO THIS ISSUE GETS MORE VISIBILITY. i think we should take her out this morning so she gets some idea of how the bounding energy she now sees, can actually work seriously. i swore i was going to get to grace's floor yesterday-- and did not.. sheila was around "the yard" dealing with the odd things that happen... like teh airconditioner in the kennel does not need to be set at 65... that is money down the wire to the electric company.. i think she asked cranney company to install a locked thermostat.. I NEVER GOT TOO FAR WITH THE FLOORING-- AS I SAT IN THE T TENT EATING ICECREAM IT LOOKED LIKE SUCH A LONG WALK TO THE BARN THAT I SAT PUTTING DOWN MANY MORE CALORIES THAN I WAS USING UP..... .. SINCE I HEARD RUMORS OF 2 INCHES MORE OF RAIN TODAY-- MAYBE WAYNE CAN PUT THE FLOOR DOWN-- I HAVE EVERYTHING UP THERE.... EXCEPT THE ENERGY TO DO IT -- BUT I HAVE ABOUT ENOUGH ENERGY TO GET SOMEONE ELSE STARTED. QUICKEN DEPOSITS FOR A COUPLE MONTHS-- AND THE BANK NOT RECEIVING IT THERE IS A $3000 DIFFERENCE IN THE BANK STATEMENTS.-- I KNEW WHAT IT WAS AND WHY IT WAS-- BUT YOU TRY AND EXPLAIN THAT TO A GUY IN A BLUE SUIT CARRYING A BRIEFCASE.. AND CARRYING ALOT OF PRECONCEIVED NOTIONS ABOUT MATCHING NUMBERS.. SO I HAVE ALOT OF ARGUING WITH QUICKEN TO DO..
WE NEED ONE OF THOSE... NOW--- TODAY--- YESTERDAY !! ----- PREFERABLE PROBONO IF THERE IS SUCH A THING. MAYBE NOT ALL OF YOU HAVE HEARD MY" LIFE DUE TO AN ACCOUNTING ERROR" STORY. BRIEFLY ---I WORKED FOR THE WANT ADVERTISER MAGAZINE FOR 30+ YEARS--- OUT OF MY HOUSE-- VERY CASUAL JOB-- JUST GET IT DONE-- NO HOURS ETC.... AND I MANAGED THE DISTRIBUTION NORTH OF THE CHARLES RIVER-- ON INTO MAINE.. I WAS - HISTORICALLY AN MATHEMATICIAN-- SO WHEN COMPUTERS CAME ALONG I JUST WHIPPED TOGETHER MY OWN ACCOUNTING SYSTEM TO KEEP TRACK OF 16 DELIVERY ROUTES/PEOPLE WITH THEIR VARIOUS STORES CHARGE ACCOUNTS. AND MADE IT GIVE ME A ONE PAGE PIECE OF PAPER AS A MONTHLY REPORT. EXTREMELY SIMPLIFIED.. THIS ONE SHEET I FOLDED IN MY BACK POCKET OF MY BLUE JEANS AND OCASSIONALLY WENT TO A MEETING WITH THE PRESIDENT OF THE COMPANY-- WHERE I WAS JOINED BY AN IMPRESSIVE LOOKING COMPANY ACCOUNTANT IN A BLUE SUIT WITH BRIEFCASE AND POLISHED SHOES. HE HAD AN IMPRESSIVE MONTHLY REPORT-- ON THAT OLD IBM ZIG ZAG FOLDED COMPUTER PAPER THAT WAS ABOUT 1/2 INCH THICK... I HAD MY ONE WADDED UP PAPER IN MY POCKET..... HE DEMONSTRATED HOW EASY IT WS TO FLIP THRU THAT DATA AND SCAN FOR A STORE THAT DID NOT HAVE 4 CHARGE SLIPS FOR THE MONTH... MY ONE PIECE OF PAPER HAD ALREADY DONE THAT..
AND THEN I NOTICED HIS TOTAL $ DUE.. SO I SAID TO THE PRESIDENT (THESE WORDS BUILD OUR BARN AND ARENA)" HIS REPORT IS WRONG... I CAN NOT RIGHT NOW TELL YOU WHY IT IS WRONG BUT IN 25 WORDS OR LESS I CAN PROVE IT." THAT WAS PRETTY MUCH THE REASON THEY GAVE ME THE RESPONSIBILITY OF ALL THE ENTIRE COMPANY-- NOT JUST MY NORTHERN AREA... AND THEY PAID ME 1/2 WHAT THEY PAID HIM-- A HUGE BARGAIN FOR THEM-- MUST HAVE TAKEN ME AN ADDITIONAL 37 MINUTES WEEKLY TO ADD THIER NUMBERS TO AN ALREADY EXISTING SYSTEM. A PUZZLE FOR ANYONE EXCEPT A MATH TYPE. IT WAS SORTING THE NUMBERS LIKE THEY WERE LETTERS.. LIKE THE PHONE BOOK... the S's----SMITH, SMITHSON , SMITHSONIAN , THEN THE "R's" RUTGERS.... and on. LIKE IF YOU CAN DEFINE A NEED AND DO IT WELL, DO YOU NEED A MULTI MILLION DOLLAR COLLEGE DEGREE? I STILL MAINTAIN ALL COLLEGE TAUGHT ME WAS A DEADLINE WAS SERIOUS. .
4PM WAS NOT 4:01-- BEING ONE MINUTE LATE FOR AN AIRPLANE IS NOT GOING TO WORK TOO WELL. DOES THIS PERTAIN TO TODAYS SDP??? TO THIS DAY I AM CONVINCED A COLLEGE DEGREE IS WORTH LESS THAN A GOOD WORK ETHIC. I ALWAYS HIRED KIDS WHO TOOK CARE OF THEIR OWN HORSES- BECAUSE THERE WAS A RELIABILITY INSTILLED IN THEM-- BILZZARDS DID NOT MATTER YOU HAD TO GET WATER AND HAY TO THEM. THEY WERE/ARE EXCELLENT EMPLOYEES. WANT A 2014 DOG FEST T-SHIRT? YOU WILL RECEIVE ONE IF YOU'RE ATTENDING!! 5th, decision will be made shortly after that date so that shirts can be ordered. i think we have such good sound now that we have to be careful about leaving a radio on in the next room.. it will be on only around mail call and maybe at "birthing parties.." not all the time..... i prefer to vent minus world wide coverage. it is attached to the camera with no wires dangling.. tim said there iis a slight hum that could be fixed by wiring it straight to the camera... which means taking it down and apart. forgot to deposit the $30 of fun money, i spent it on this builders paper which will prevent the floor from squeeking.. when you come here for dog fest you can all climb he ladder and test "to squeek or not to squeek"
enjoy al's comment about tess when she was working... by the way she is doing very well-- she is here because sunday sandy had a death in the family.. Thanks for the update on Tess and how She is doing! I have been wondering how She is. In a recent DD you mentioned the sign for no more treats and the Dogs know the meaning of it. I don't think I ever related to you how much more they pick up around the farm. I know you have chickens and that larger dogs "baby sit" the puppies for safety esp. from birds of prey while they are little. ON AN AIRCRAFT CARRIER THERE ARE RED YELLOW BLUE SHIRTS ALL INDICATING DIFFERENT JOBS AND WHO SHOULD BE ON THE DECK AT WHAT TIME. I DID NOT COPY THAT CONCEPT-- BUT I APPRECIATE IT.. THE PURPLE PEOPLE AROUND HERE HAVE PUT IN HOURS-- THERE IS NO SET NUMBER- BUT THEY HAVE COME TO REALIZE- RULES ARE RULES AND CAN BE CHANGED/REVEARSED IN A SPLIT SECOND- SO YOU JUST FOLLOW THEM AND DISCUSS THE IDEA LATER. THAT PARTICULAR SITUATION WAS NOT LIFE THREATENING-- WE WERE TRYING TO SHOO A MOMMY DUCK AND HER DUCKLINGS WHICH WERE ON THE OTHER SIDE OF THE FENCE UPSETTING TO HER NO END... SHE HAD HER RULES TOO... "FOLLOW ME" AND THEY COULD NOT. WE GOT THE KID OUT OF THE WAY AND MOMMY'S CHILDREN IN A LINE BEHIND HER AND ALL WAS WELL. IN MY LIFETIME THAT KID COULD HAVE BEEN KILLED.. TAKE THE SITUATION OF A HAPPY HORSE RUNNING AND BUCKING TO THE BARN AND THAT 1000 POUND HORSE WILL GO THRU THE GATE WHETHER THERE IS A KID IN THE WAY OR NOT..
MY 2 KIDS + CINDY CARGILL WOULD CRAM THEMSELVES IN THE BARREL THEN TURN AROUND AND STAND UP TO LOOK AROUND. 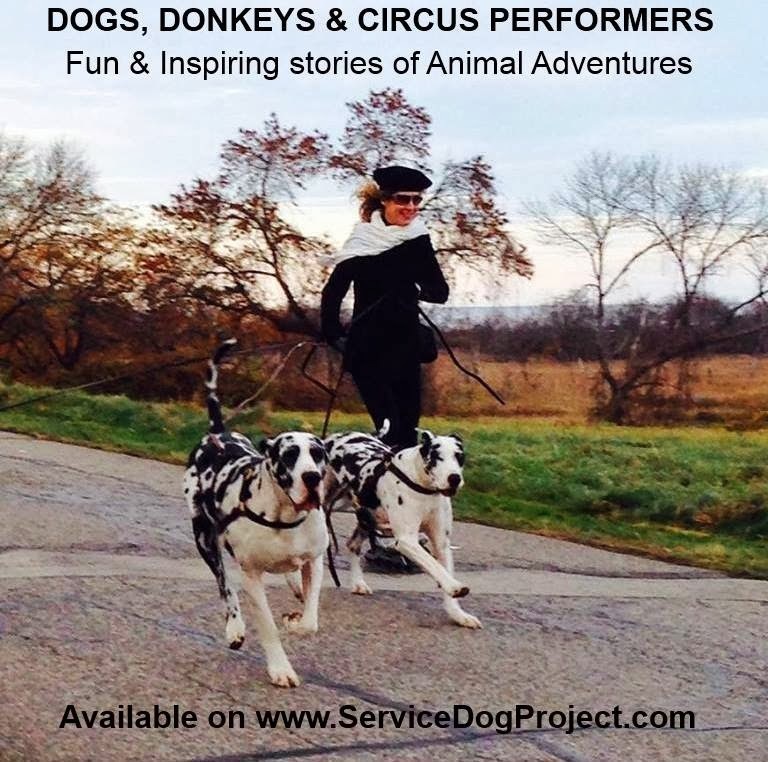 IN HER BOOK ( DOGS DONKEYS AND CIRCUS PERFORMERS)JANINE TALKS ABOUT LEARNING ABOUT THE ELECTRIC FENCE AS A SMALL CHILD-- I TOLD HER NOT TO TOUCH IT.. AND SHE DID. SO WHEN I SEE A PURPLE SHIRT- I REALIZE THERE IS A BIG RESPONSIBILITY TO THE DOGS THAT GOES WITH IT. IF A WATER BUCKET IS EMPTY- THEY ARE GOING TO FILL IT AND NOT SAY "I FILLED IT YESTERDAY IT IS SOMEONE ELSE'S TURN TODAY"
AND ROGUE IS RECOVERING FROM SPAY-- AND SHOULD GO HOME TODAY .. SHE IS VERY ATTACHED TO MELISSA-- GOOD MATCH..
AND THEN THERE IS THE FINANCES--- THE PAYROLL. DURING THE PAST 2 WEEKS OF FILLING SLOTS JUST TO GET UNDER CONTROL, THE PAYROLL BLOSSOMED TO $5200 PER WEEK-- THAT IS NOT SUSTAINABLEE---- WE ARE GOING TO HAVE TO GO BACK TO THE ORIGIONAL PAY SCALE WHICH IS MORE LIKE $3000 A WEEK.. MOSTLY IT IS MINUS THE YOUNGER KIDS WHO ARE A HUGE HELP- AND IT IS NOT FILLING THE SLOTS OF THE PERSONEL CHANGES. WAYNE HAS VOLUNTEERED TO DO THE PROPERTY TYPE THINGS..-- HE THINKS IT IS GOOD EXERCISE TO POUND POSTS.. AND THE OTHER VOLUNTEERS HAVE BEEN TERRIFIC... I AM GOING BACK TO DOING SOME THINGS I NEVER SHOULD HAVE GIVEN UP DOING. IN GENERAL THINGS ARE MOVING MUCH SMOOTHER NOW. I WOULD LOVE TO GIVE EVERYONE A RAISE--- THEY ARE CERTAINLY DESERVING ... BUT IT IS NOT POSSIBLE- AT LEAST AT THE MOMENT. WE HAVE A BALANCE OF ABOUT $50,000 LEFT ... WHICH WITH THE 11,000 PER MONTH FROM THE CHICKEN PROJECT AND MISC DONORS... WE WILL MAKE IT...WITH CARE. ALL OUR BILLS ARE CURRENT. THE WATER BILL OF $600 AND ELECT BILL OF $1900 WERE KILLERS-- SO WE PUT UP THE SCAFFOLDING AND ARE AIR DRYING THE HEAVIER BEDDING. ALONG THE WAY WE DID HAVE A $25,000 ANONYMOUS DONOR--- BOY DO WE LOVE ANONYMOUS DONORS. MY PRINTER IS ECO FRIENDLY-- IT REFUSES TO PRINT MUCH OF ANYTHING. I WISH WE HAD MORE CUT AND PASTE REPORTS-- THIS FACEBOOK IS RUINING MY SUPPLY OF INFO I DO NOT DO FACEBOOK I AM TOO OLD TO START NOW... THERE JUST SEEMS TO BE TOO MUCH TO WADE THRU TO FIND ANYTHING INTERESTING.. HE IS THE FIRST PHOTO ON OUR WEB... AND I HAVE HEARD NOTHING--- EXCEPT SECOND HAND THRU MEGAN AND FACEBOOK-- WHICH UNFORTUNATELY IS VERBAL AND WOUD NEED RETYPING. THE FREEZER-- IN THE FINE PRINT THE LITERATURE SAYS 48 HOUR DELIVERY ON ONLY SOME EQUIPMENT.. UNFORTUNATELY THE OUTDOOR FREEZER IS NOT ONE OF THEM... WE ARE PLEADING.. ALONG WITH GRINDING OUT THE PC REPORT FOR THE MASS ATTORNEY GENERAL'S OFFICE. SO I WILL FILL IN THE LITTLE BOXES TODAY-- BUT WE DEFINITELY NEED AN OFFICIAL FINANCIAL REVIEW. TIM SAID PLUG IN THE NEW MIC--- SIMPLE SOUNDING--- I WILL DO THAT LATER THIS MORNING SO I DON'T WAKE EVERYONE UP AS WE TEST IT. WHO WAS THE IDIOT THAT SAID THIS IS A PAPERLESS SOCIETY.?? I am coming back to Massachusetts for an interview on Thursday, July 31. My interview is at the John C. Page Elementary School in West Newbury for a special education secretary position. If you or anyone there (maybe Donna?) knows someone at the Pentucket Regional School District, I would be grateful for a good word. I applied to Dianne Ferrara, Human Resources. Would you have room for me at SDP for Thursday and Friday nights--July 31 and August 1? My flight back to Indiana is on Saturday, August 2. I will definitely be there this Saturday- Sunday! Thank you! My thought was that I would come up again on Friday the 8th and cancel my Monday therapy appt so I could stay through Monday 11th to make a good 4 days not interrupted. Does that sound like a plan? SAME DEAL--- THESE PUPS ARE BEGINNING TO THINK-- AND WE HAVE TO BE SURE WE "SPEAK CLEARLY" TO THEM IN A MANNER THEY HAVE COME TO UNDERSTAND. AS I TYPED FUN... I REMEMBERED THE SIGN FOR FUN... 2 FINGERS RUSHING THE TIP OF YOUR NOSE..
FUN AND SH#T ( 2 FISTS ON TOP OF EACH OTHER -- THEN LOWER THE BOTTOM ONE) ARE TWO OF TH E SIGNS WITH WHICH I AM MOST FAMILIAR. SHEILA AND I HAD A GOOD TIME WALTZING INTO THE HARBOUR FOOD WAREHOUSE YESTERDAY--- I HAD TO GO THERE TO GIVE THEM A CHECK FOR THE FREEZER-- NICE PLACE CLEAN OPEN OFFICES WHERE WE COULD PLUNK DOWN OUR MATCHED SET OF WELL BEHAVED DANES... BENTLEY AND OPAL.. TO SHOCK ANYONE WHO OPENED A DOOR AND WALKED IN.... WE WERE IN FULL SWING AND FENDED OFF COMMENTS AS WE SAT THERE. AS A TEAM... WE ARE GOOD. THEY REALLY IMPRESSED SHEILA WITH THE FACT THAT THE FREEZER MUST BE LEVEL OR THE CORNERS DO NOT GO TOGETHER.. I JUST EMAILED THEM AND REMINDED THEM THEY COULD WATCH THE CONSTRUTION ONLINE AND COULD CALL US IF THEY SAW US DO SOMETHING INCORRECTLY. FOR CONCEPT-- IT WAS A GOOD IDEA-- WE MIGHT GET SHELVING--- ESPECIALLY IF WE PUT UP A SIGN ASKING FOR IT.???? WE USED TO DO ALOT OF FILMS THERE--- UNTIL SOME MOVIE CREW LANDED A HELICOPTER UNEXPECTEDLY IN A FIELD.. AND ANNS RELATIVES WERE NOT AMUSED. THAT CHICKEN BRICK BOARD IS DIRECTLY CONNECTED TO BENTLEY'S LOVE LIFE. I THINK WE WILL HAVE 2 LIFT AND CARRY TYPES HERE TODAY- SO THE URGE IS ON TO MESS ABOUT WITH CHAIN LINK AND FENCING. pam was overnight and she is trying to make our organization , organized. #1 earlene and i removed 4 trash cans from our prime real estate, the t tent. sunday stewers could barely get in there because of all the extra trash cans. #2 the dumpster is collected by volume-- fill it - they take it. the green trailer is dumped at the transfer station by weight. roll on th e scale go unload.. get on the scale and pay the ticket. #3. the manure pile is NOT to be used as a trash receptacle. that is a valuable resource people will pay me for. one soda can or hay string, and i have to pay to have it removed . shape up. #4. we do have provision for recycling-- and returnable cans/bottles so do that. #5. we have mobile trash containers-- called vans--- ridiculous--- so i am asking we have trash containers next to the 2 gate openers where you have to sit and wait for the gate to open-- so unload the trash !!! and if it is raining -- tip them sideways so they don't collect water. the gate openers are a place where everyone goes- even those with their own remote usually sit and wait... we can use that time to clean the vans etc..
putting up signs ---makes the assumption that people read-- which is simply not true..
plus the more signs you have the fewer people will read..
a critical one---we need "don't park here on a monday because the dumpster people need space..
if you need a sign that says "please throw trash in the can" then you are too foolish to even be on the property. the handling of trash is a bigger problem than most people realize.. "throw it away " is a thing of the past-- we have run out of an AWAY to throw things. i have seen horror shows about the trash situation in china-- they may have inherited all our manufacturing... but they also inherited all the problems that go with it-- like trash. i have fish to fry-- like ordering the walkin freezer. and i really would like to investigate a new golf cart. means they are being bad... and all they hear is the good dog part. We are working to combine all the information we have to create a comprehensive list so we can email volunteers on a regular basis with info, needs, etc...and so we can work on more consistent scheduling. If you are a current volunteer or want to volunteer please send Pam an email with "sdp volunteer" in the header, to pampaul@gmail.com. Thank you! Our Volunteer Meeting is scheduled on Sunday, August 3 from 9:45-10:45am. This gives us time to help before and after to compensate for the lost “working” time. We will discuss scheduling, tasks, and other items related to the organizing of volunteers and the tasks at the farm. WE ALSO GOT A BUNCH OF OTHER THINGS DONE AS MANY OF THE OLD TIMERS SWUNG INTO ACTION DOING WHATEVER INSPIRED THEM.. I OWN EVERY PIECE OF EQUIPMENT EVER SOLD WITH THE PROMISE "GET YOUR OFFICE ORGANIZED"
MY FILING THINGS BY SHAP AND SIZE HAS ALWAYS MADE FOR A NEAT TIDY WORKSHOP --- BOLTS ONE PLACE .. SCREWS ANOTHER-- KIND OF THING.. BUT IT RAISES HE// WITH PAPER WORK - PAPERS ALL LOOK THE SAME. JACK WHIPPED THE KENNELS TOGETHER....ALL KINDS OF PROGRES-- THERE ARE THE USUAL BUNCH OF EXCEPTONS-- THE VERY FIRST KENELL HAS A DOGGIE DOOR ONLY 12 INCHES WIDE DUE TO TH E STUDS THAT HOLD UP THE HAY LOFT... BUT WE MEASURED A ROUND DOG... OPAL- AND FIGURED SHE COUDL SQUEEZE..-- AND I AM SURE IF A GIRL DOG WAS ON THE OTHER SIDE BENTLEY WOULD GET THRU ALSO.. THE OTHER END IS WALTER'S SUITE---DURING THE DAY WHEN HE IS HERE WITH MEGAN WE CAN PUT DOWN A RAMP TO HIS 4X6 SLEEPING LOFT-- WHEN HE GOES HOME PULL THE RAMP AND LEAVE ONLY A LOWER 4X4X PUPPY SIZE LOFT FOR A GROUP OF PUPS. MEANWHILE--- THE NUTT HOUSE IS READY TO BE RE-ASSEMBLED--- BUT HAVING STOLEN A FEW PIECES OF CHAIN LINK TO DEAL WITH SPECIAL SITUATIONS IN THE NEW AREA OF THE BARN, PUTTING THE NUTT HOUSE TOGETHER WILL BE THE USUAL PUZZLE... WE HAVE ALOT OF MISC CHAIN LINK FENCE--- IT WOULD BE NICE TO HAVE THE NEW BARN LOOK CORRECT....AND USE THE STRANGER PIECES IN THE NUTT HOUSE...NOT QUITE SO VISABLE. PAM HAS TACKLED THE VOLUNTEER LIST-- AND IS DOING A FANTASTIC JOB- YOU ALL SHOULD HAVE HER EMAIL ADDRESS--- SO SHOULD I--- AND WHEN I GET IT I WILL SHARE IT WITH YOU. SOMETIMES CREATIVITY IS A BAD THING. I THINK WAYNE WILL BE HERE TODAY TO HELP WITH THE KENNELS AGAIN... WE HAVE MASSIVE CHAIN LINK MOVING AND SOLIDIFYING.. MY USUAL TYING WITH HAY STRING WORKS REALLY WELL FOR THE DESIGN STAGE-- BUT SHOLD BE REPLACED WITH T EH CLAMP/BOLT OFFICIALL THING.--- AND WE DO HAVE THEM. BECAUSE THOSE 6 NEW KENNELS NEED THOSE RAIN PROTECTING LITTLE TUNNELS TO KEEP THE RAIN/SNOW OFF THE ROOF FROM HITTING THE DOGS IN THE HEAD AS THEY USE THE DOGGIE DOORS. I WILL NOW SPOON FEED THIS TRIBE--- WE SPLIT TH ELITTER BY COLOR, ONLY BECAUSE THAT MEANS NO MISTAKE OF ROTATION TO TH EHOUSE. happy day after the 19th because i forgot..
and i did not trip over the tripod. what more could i ask for.??? granted i now can replace them with more chain--- or even rope-- but in the design phase of this-- i could snap away the adjustments til i got it level...... somewhat like i do whit fence posts and hay string. with the tripod there was always a "width" problem-- the tri...pod... ( 3 feet in latin or something..) was it better to have one leg behind the sofa and 2 in the door way--- or 2 stuffed backwards and ony one really in the way.????... because there is a part of the human anatomy which did not easily fit thru the remaining space whether it was two smaller leg liftings or one big one. however the camera is now hung in the doorway... becoming a real headwhacker... which is far safer for the camera. humans will have to learn. now the value of this camera is not a million dollars--- tho the results of having it could eventually reach numbers like that, ---we have as volunteer , an honest to goodness carreer tech who seems to know "stuff" i can not even dream about.... and she saw the microphone that tim sent and was impressed that explore was taking such good care of us..
i have not had permission from tim to plug it in yet.... i don't know if he has to talk to it first-- even if he is in siberia. jack brought laura to work yesterday-- and took one look at our kennel project and 14 minutes later he had constructed the remaining 4 stalls that would have taken a normal person 3 days to do. jack is a constant reminder that hiring someone who knows what they are doing may take the excitement out of a project but provides a consistancy and speed that is incomprehensible to most around here. shannon has arrived-- and has gone with grace to make all the barn dogs bark..... the house is dead quiet since hillary fed at about 5am. i will tell chaos that paul is coming today--- it is not paul who will be here- but earlene--- chaos thinks earlene's name is paul and the minute i tell her "pauls is coming today "she will stand at attention til earlene arrives -- so i don't say anything til we get closer to the eta. meatcutter steve left a huge tray of coldcuts--- i will be very sorry when his school goes on vacation--- we get the left overs- which are sometimes extremely good. whatever school that is-- they eat well..